"My boys LOVE this! It is quick and simple! I am always asked to bring this to Super Bowl® parties and family events!" Heat garlic bread with spread side up on a baking sheet in the preheated oven until warm and golden brown, 10 to 12 minutes. Set aside to cool. Bring spaghetti sauce to a boil in a large pot. Place frozen meatballs into sauce. Reduce heat to low and simmer until meatballs are heated through, about 20 minutes. Tear garlic bread into bite-size pieces and spread into bottom of a 9x13-inch baking dish. Pour spaghetti sauce and meatballs over garlic bread, coating bread with sauce and distributing meatballs evenly. Spread mozzarella cheese over top in a layer, followed by a layer of Parmesan cheese. Bake casserole until cheese has melted, 20 to 25 minutes. If you are using the frozen garlic toast that is already sliced packaged in boxes, I usually need 2 boxes. 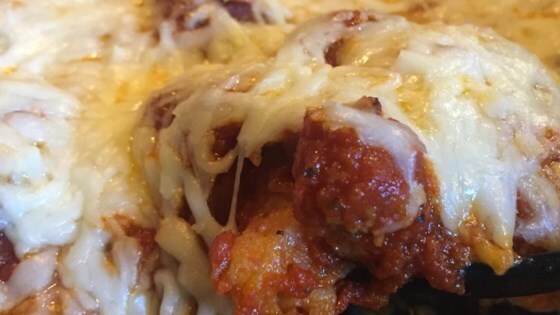 I have even used the frozen garlic bread with cheese, and it is great too! It is fast and tasty alternative to pasta. I lined garlic bread around dish and put sausage with meatballs in center easy and great.